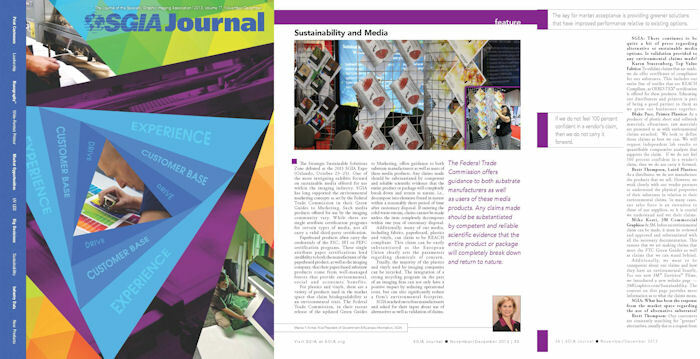 The SGIA Journal's November/December issue included a feature on sustainable media. Karen Stuerenberg, our Marketing Director, contributed to this article on sustainable media and the advancements in the industry. "What has been one major stumbling block that you have encountered as you move (sustainable) materials to market?" SGIA asked, and Karen explained, "When offered, printers oftentimes seem surprised by how well the newer materials print, as "sustainable" materials can seem to carry somewhat of a stigma about being not as good as traditional media. As our materials are engineered for superior printing, we find that customers don't automatically assume that the materials are alternative until that specification is stated. That just speaks to the advancements in technology and how the industry is progressing. We're making tremendous strides and it's exciting to be part of it." While it was true in the past that sustainable media just didn't stack up to traditional media, that's beginning to change. Direct Print Textiles from Top Value Fabrics are not "just" a sustainable option as they have leveled the textile playing field. This line represents a standout advanced printing platform that also has the advantage of being fully REACH Compliant. Learn more about this product line here or read SGIA's "Sustainability and Media" feature here.